Why are the elderly being left in the cold by their families in a land that reveres the old? She was excited at the prospect of going on a car ride with her only son. “I was looking forward to spending some time with him,’’ she says. The frail septuagenarian agreed to the journey, not knowing that it would be the last time she’d ever see her son and his family. “Although I was trying to make conversation with him on the way, he appeared to be deep in thought and was silent,’’ she remembers. After driving about 40 minutes, once they were on the highway, Amit, who is 50 and a father himself, stopped the car near a roadside fruit stall and asked her to step out to buy some apples. “As I was choosing the fruit, I saw my son start the vehicle, and before I could call out to him, he sped off,’’ says Kusum, a tear rolling down her deeply creased face. Taking pity on the elderly woman sitting sobbing by the side of the road, a few local residents helped her to an old-age home run by a charity in Ghaziabad. Emotionally distraught, she was initially reluctant to provide details about her son to the volunteers, but after much prodding she finally revealed his address. A month later, representatives of the charity tracked down Amit to ask him to take his mother home, but he refused, saying he was disowning her as she was a burden to care for. The saving grace in Kusum’s case is that she was not physically abused, unlike Uma*, a thin, frail woman who lies on the cot next to Kusum’s in the Ghaziabad home. The 80-year-old woman’s hands and legs bear marks of bruises and cuts, a result of the abuse she suffered at the hands of some relatives. They tortured her, forcing her to give them all her gold jewellery worth around Rs90,000 (Dh6,128), before they dumped her in front of the old-age home one evening in May last year. “They didn’t want me so they took all that I had and dumped me here,’’ she says, her voice flat. Kusum and Uma are just two of the millions of elderly people with uncaring family members who take their limited riches before throwing them out of their homes. A report by HelpAge India, a voluntary organisation working for abandoned and needy elderly people, reveals some shocking statistics. 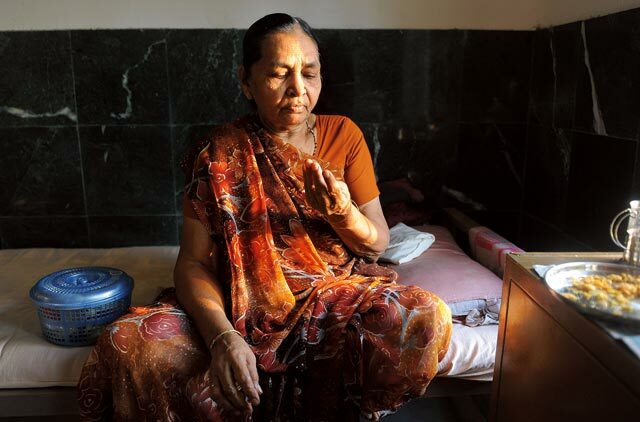 According to the report, one in three senior citizens is a victim of abuse in India. “Some of the abuses we found are as brutal as severe beating of elderly people by their own sons, daughters and daughters-in-law,” states the 2012 report. It also says that in more than 50 per cent of abuse cases, the perpetrators are family members, with the son being the primary abuser in over 56 per cent of cases, followed by daughters in 23 per cent of cases. The most common reason for the abuse is property related. Mathew Cherian, chief executive of HelpAge India says, “Earlier, people lived with their children when they were too old to work, but society is no longer parent-oriented and the rising trend we notice is that the elderly are moving out of their homes to places that cater to their needs.’’ But there aren’t enough old-age homes in India to house all the abandoned elderly people, he says. More than half of India’s 1.1 billion population is younger than 25 and two-thirds is below the age of 35. The number of seniors is growing. By 2016, around 113 million people will be older than 60, and if the recent reports are any indication, a sizeable number of them will require an old-age home. Stories about mistreatment of the elderly can be truly horrifying. A few years ago, there were reports in the Indian media about how police caught a man striking a deal with doctors and an organ-transplant broker to sell his unsuspecting father’s kidney, first taking him to hospital for a ‘check-up’ and then telling him he needed an operation. Doctors say such practices are commonplace. Last year, in the southern city of Hyderabad, the well-off family of a 75-year-old cancer patient decided to burn her alive at a crematorium because they did not want to pay for further treatment. She was saved when the crematorium staff noticed her stir and called police. Elderly parents being abused and abandoned is not just an urban phenomenon. In rural India, the family system is eroding, with the younger generation increasingly heading off to cities with their spouses and their children to start a new life – without their parents or grandparents. According to a 2012 survey by HelpAge India, less than 40 per cent of Indians now live with extended family. While Delhi has the highest number of senior citizens who own property, over the years they become meek and dependent on their children. And that is generally when problems arise. Those who have worked in government service or for a reputed private company receive pensions, but a large majority of India’s population still work as farmers or day labourers. Once they are too old to work, they are forced to rely on their children or extended family for support. There is a government-backed pension programme for the poor called the Indira Gandhi National Old Age Pension Scheme, which provides Rs200 a month to people over 60 who live below the poverty line, meaning they earn less than $1.25 (Dh4.59) per day. But the amount they receive is barely enough to get them food for a week. The government also approved a bill to increase the pension to Rs500 a month to those over the age of 80. Mathew says, “At the policy level, the government needs to do a lot more to provide social security to the elderly... The long-term measure would be to offer them at least Rs1,000 per month. “In 2007, the Maintenance and Welfare of Parents and Senior Citizens Bill, which protects the rights of senior citizens, was passed in parliament. It provides an inexpensive and efficient system where the elderly could petition the administration to seek maintenance from their family. Mathew is worried about people like 70-year-old Kathleen Lama, originally from Darjeeling a city in West Bengal, who made her home on a patch of land in Nizamuddin, Delhi, several years ago. But she ended up on the streets after her husband died and her kids didn’t bother to look after her. There are thousands more like her on the roads of India, forgotten. There are shelters for homeless elderly people run by charity organisations across India, but these shelters are usually packed to capacity. Hukabhai Somabhai, 70, was brought to Atitna Ashirwad Vrudhashram, a crowded shelter for elderly homeless people, at Hirapur Chowkdi, some 20km from Ahmedabad, by volunteers who found him wandering in the streets. Parvatiben, 75, also lives in the shelter. She was found by volunteers roaming in the streets of Ahmedabad. Both had been abandoned by their families. “With the joint family system withering away, the elderly are being abandoned,” Meira Kumar, a social justice minister in the Congress Party-led government was quoted as saying in 2007 when the bill to protect the elderly was presented in parliament. The legislation calls for a three-month jail term if children do not look after their elderly parents. At the time, Meira said she hoped the penal provision would act as a deterrent. There have been a few instances when the elderly have taken shelter under the law. A couple of years ago, a trial court ordered Delhi residents Sonu* and his wife Geeta* to vacate the home of Sonu’s mother, Kamla Devi*, after the elderly lady filed a complaint alleging that the couple “mentally tortured” her. Kamla, who is in her mid 70s, said that she had built the house with her own money and, since she was a widow, had allowed her son and daughter-in-law to live with her out of love for them. However, they started harassing her and asking her for her property. Upset, she went to court and the court ordered the couple to vacate the house within a month. It also asked them to pay Rs3,000 per month as damages to Kamla from the time she filed the petition. Unfortunately, not many are as bold as Kamla, and the long wait due to the huge number of pending civil cases in Indian courts can tire most of the petitioners. In June 2012, the Delhi High Court issued an order to all court judges to give “special focus” to the cases involving senior citizens and ever since, courts in other cities are also taking similar steps. Significantly, the bill states that a person would be disinherited if he or she fails to take care of their elderly parents. HelpAge has welcomed the legislation but says it may have little practical effect. Most parents are too demoralised, destitute or frail to begin a battle to get a ruling, HelpAge’s Mathew says. Also, “very few people will want to wash their problems in public,” he says. But Mala Gupta* is one woman who is seeking redress under this law. After her husband Rajesh* passed away in 2010, she was confined to a single room in her own home by her son and his family who occupied the rest of the house. She was also being tortured by her son and his wife who wanted her to transfer ownership of the house and the land to his name. Fed up, she filed a complaint with the police, but that did not help. In fact, it only served to incense her son who unceremoniously threw her out of the house. Out on the streets Mala, who is over 60, initially took shelter in an ashram in Benaras, Uttar Pradesh. But with her daughter’s support, she has now filed a petition in the court, hoping her son will be evicted from her house. One elderly gentleman who, sidelining his own trauma, has decided to reach out to assist others is Avikar Raj. The 66-year-old who was working in a law firm in the UK, returned to India keen to spend the last years of his life with his extended family in southern India. However, once his sizeable savings were exhausted they threw him out of the house, he says. With barely a few thousand rupees in his pocket Avikar, who was diagnosed with leukaemia, reached Delhi where, by sheer chance, he met Ravi Kalra who heads The Earth Saviours Foundation. Ravi, who runs a home for the elderly and mentally challenged people in Delhi, took Avikar, who is a graduate from the London School of Economics, into his fold. 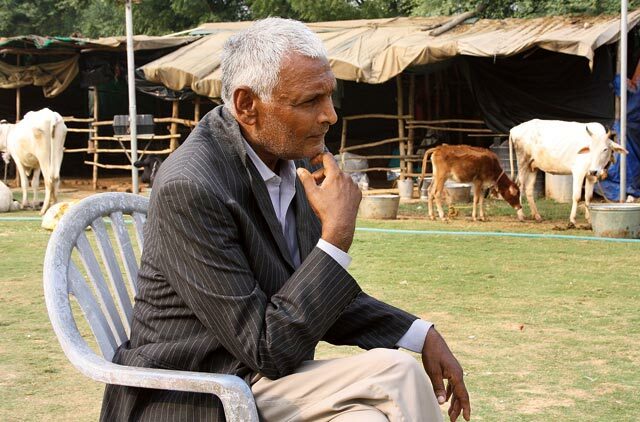 Avikar says, “When you retire and have no family life, you feel isolated and alienated. And I, who led a very active life, felt the impact much more. But I am desirous of spending the rest of my life in social work.” Today he helps Ravi manage the foundation. Those in old-age homes perhaps know the answer to Gyan’s question. Sitting quietly on her bed at the old-age home where she lives, Kusum nods her head silently and wipes a tear with the corner of her sari when the caretaker of the home enquires if she is comfortable. She has few complaints. Staring blankly into the distance, her only hope is that her son will return to pick her up and take her back home. Clutching her walking stick, she gets up from her bed and makes her way to the window where she holds the bars and stares out. “I hope I’ll see my son at least once before I die,’’ she says, in a soft voice. Rani, a volunteer who works at the old-age home walks up to her. “Don’t worry,’’ she tells Kusum. “We all love you and will look after you. And you can always consider me your daughter,’’ she says, before giving Kusum a warm hug.